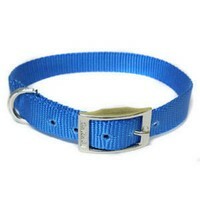 Canac Nylon Dog Collar (Blue) has been manufactured from extremely durable, yet soft Nylon webbing to create a collar for your dog that is both strong and comfortable. The collar has a die cast buckle and evenly spaced eyelets to ensure a secure fit, and also features a high quality of sewing that adds to it's strength and reduces the chance of fraying. A large solid D ring guarantees maximum strength when a lead is attached.